In NetEnt's aquatic-themed adventure slot, Subtopia, we boarded an underwater exploration sub with just a bunch of crazy marine biologists for company. 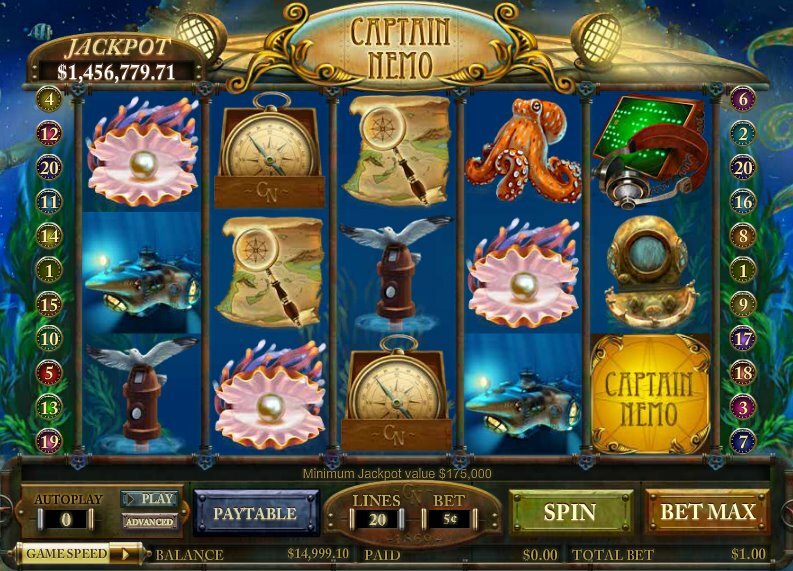 Now developer Amaya tread similar territory with their 5-reel, 20-payline, Captain Nemo online slot. Based on the literary adventures of Jules Verne's classic character and his submarine, the Nautilus, we dive, dive, dive into a world of treasure maps, submarines, pearls, giant octopuses, anchors, and tropical volcano islands, all of which are represented in perfect rendering on the reels. The sunken ships icon is the game's Wild, and substitutes for all symbols other than the scatter. Five Wilds offers up a rather tasty 4,000 coin jackpot. The Captain Nemo logo, meanwhile, acts as the scatter, with the game's bonus round being triggered when at least three of the logos appear. Get those and you'll be taken off to a familiar 'Pick the Box' style game where you have to choose from a series of sonar pings. Prizes or multipliers are up for grabs here. 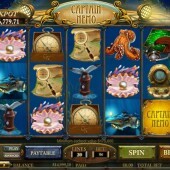 However, get three or more 'Jackpot' symbols and you'll go on to a further bonus round which shows the Nautilus's wheel. Spin each wheel in turn to increase your win. Take it all the way and you could be looking at a jackpot worth thousands. Underwater slots are about as plentiful as those featuring ancient Rome, Egyptian pharaohs, or buffalos. Captain Nemo, with its interesting bonus round and jackpot, is certainly a worthy addition to that suite, and the graphics are beautiful. Take a dive and find Nemo's jackpots.